Neala and Tony's picnic themed wedding looked like such great fun. Neala's attention to detail and planning can be seen in all elements of her wedding. I love the picnic baskets - What a great idea! I also like her advice around choosing a theme. Neala suggests using a feeling instead of colour. Such a great way to make sure you are always focusing on the important things. Favourite wedding day moment: I actually really liked seeing and talking with our guests. That was the highlight – seeing all our friends and family who had travelled to witness our marriage and celebrate with us. Advice for future brides: Spreadsheets are great for keeping organized. And more organized = less stressed! Also, consider using a feeling as a wedding theme. It’s a lot easier to remember how you felt on the wedding day than how your centerpieces looked! Favourite part of the dress: It was pretty and also comfy! I especially liked the detailing on the bodice. 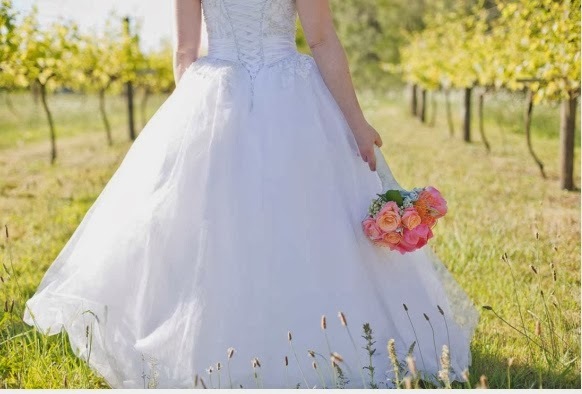 Why did you choose your dress? I wanted to show a more hourglass figure, and I just loved the way it fit on me. I knew when I tried it on that this would be The Dress. What made your Astra Bridal experience special? : Mala, who helped me find the right dress, was very friendly and helpful. She made me feel comfortable and knew which dresses had the features I liked – namely, the smaller waist! Wayne, Mala, and Sara knew I needed a dress within a quick timeframe, and helped me find one that would be perfect in time. I initially had a dress designed and made by an overseas family member who designs dresses for a living. It arrived two weeks before the wedding, and while it was beautiful, it was too small for me. I was very lucky to find another amazing dress so quickly!